The purpose of this study was to evaluate urine monocyte chemoattractant protein-1 (MCP-1) and IL-8 as biomarkers of SLE flare. Urine was collected every 2 mo from patients who were followed prospectively in the Ohio SLE Study. Renal and nonrenal flares were identified and MCP-1 and IL-8 were measured by specific ELISA in samples that were collected at flare. When available, MCP-1 and IL-8 were also measured in urine samples before and after flare. For comparison, MCP-1 and IL-8 were measured in the urine of healthy individuals and in renal and nonrenal SLE patients with stable disease activity (disease controls). Most patients were receiving maintenance immunosuppressive therapy before flare. 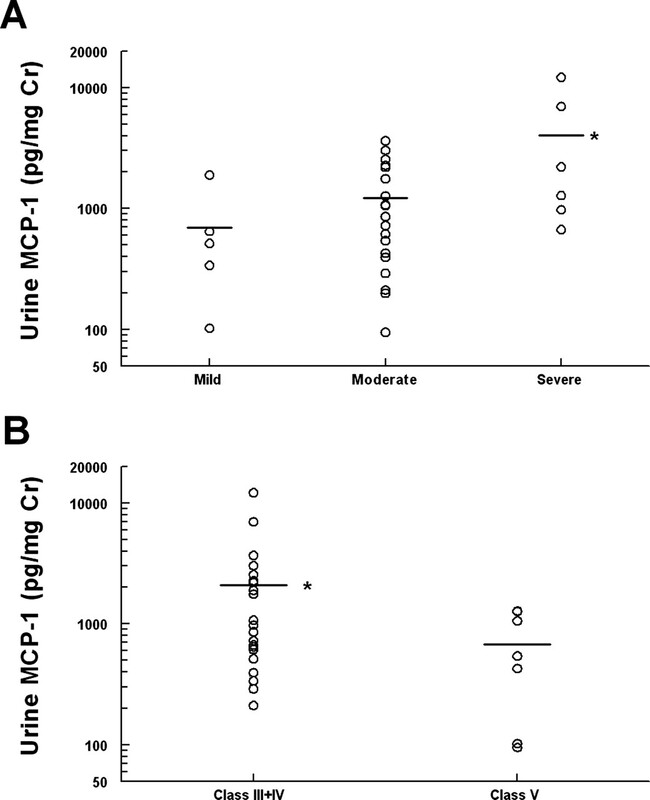 At renal flare, mean urine MCP-1 (uMCP-1) was significantly greater than uMCP-1 at nonrenal flare and from healthy volunteers and renal disease controls. The level of uMCP-1 correlated with the increase in proteinuria at flare and was higher in patients with proliferative glomerulonephritis and in patients with impaired renal function. Urine MCP-1 was increased beginning 2 to 4 mo before flare. Patients who responded to therapy showed a slow decline in uMCP-1 over several months, whereas nonresponders had persistently high uMCP-1. In contrast, uIL-8 did not change with disease activity and was not elevated at renal or nonrenal flare compared with disease controls. In conclusion, uMCP-1 but not uIL-8 is a sensitive and specific biomarker of renal SLE flare and its severity, even in patients who receive significant immunosuppressive therapy. Persistently elevated uMCP-1 after treatment may indicate ongoing kidney injury that may adversely affect renal prognosis. Substantial animal and human evidence suggests that chemokines, in particular monocyte chemoattractant protein-1 (MCP-1) and IL-8, contribute to kidney injury in the glomerulonephritis (GN) of SLE (reviewed in 1,2). In murine models of SLE GN, genetic deletion or pharmacologic blockade of MCP-1 attenuates glomerular and interstitial inflammation and reduces kidney damage (3–5). In humans with SLE GN, MCP-1 and IL-8 are expressed in the kidneys, and their transcripts can be detected by in situ hybridization, confirming intrarenal chemokine production (6–8). Furthermore, urine MCP-1 and IL-8 (uMCP-1, uIL-8) levels are increased in SLE patients during active renal disease and in some reports decrease with treatment-induced disease remission (6,7,9–11). Thus, uMCP-1, uIL-8, or both may be clinically relevant biomarkers of SLE GN. To date, however, the association of urine chemokines with renal and nonrenal SLE activity has not been examined rigorously through serial measurement of chemokine levels before, during, and after disease flares. This study was undertaken to investigate the relationship of uMCP-1 and uIL-8 to the onset, severity, and resolution of SLE flare in a cohort of well-characterized patients who were followed in the Ohio SLE Study (OSS), a prospective longitudinal investigation of risk factors for SLE flare in patients with renal or nonrenal SLE. The patients in this investigation were enrolled in the OSS, a prospective, longitudinal study of patients with four or more American College of Rheumatology criteria for SLE. Patients were recruited for this study when they had currently active SLE, two or more SLE flares that required an increase in therapy in the previous 3 yr, or persistently active SLE defined as >4 mo of activity despite therapy. Patients with renal SLE were required to have kidney biopsy evidence of immune complex-mediated GN, plus evidence of major renal manifestations past or present taken as 24-h urine protein/creatinine (Pr/Cr) ratio >1, serum creatinine >1.1 mg/dl (women) or 1.3 mg/dl (men) attributable to SLE, or both. Biopsies were not done for purposes of entry into the study but for the standard clinical indications of 24-h proteinuria exceeding 1 g, impaired kidney function, or decline in kidney function despite appropriate therapy for SLE nephritis. Patients with nonrenal SLE were defined as never having shown major renal manifestations attributable to SLE GN. These patients had a normal serum creatinine (≤1.1 mg/dl for women; ≤1.3 for men), a Pr/Cr <0.3, and urine sediment with <5 red blood cells per high-power field and no casts. Each patient was evaluated clinically and with laboratory tests every 2 mo and provided a freshly voided urine specimen at the visit. These urine samples were placed at 4°C and transported directly to the laboratory, where they were centrifuged to remove sediment and frozen in aliquots at −80°C for later chemokine analysis. No other manipulations were done. Urine chemokines are stable in long-term frozen storage (9). Samples were thawed up to two times during analysis. We have previously shown that as many as four freeze-thaw cycles do not affect uMCP-1 (12). MCP-1 and IL-8 were measured in the freshly voided urine samples from patients at renal flare. When available, additional urine specimens collected 4 and 2 mo before the renal flare and 2 and 4 mo after the renal flare were analyzed from the same patients. For comparison, chemokines were also measured in the urine of healthy volunteers, patients with nonrenal flare, and SLE patients with physician-defined stable renal and nonrenal disease activity. After all clinical results were compiled from each 2-mo study visit, the patient’s study physician determined whether an SLE flare had occurred; whether it was renal, nonrenal, or both; and whether the flare was mild, moderate, or severe. Confirmation of the flare was required by independent review of the data by another study physician. Identification of renal flares was based on prespecified, previously reported criteria (13,14) that are summarized in Table 1. In using these criteria, it is implied that changes in serum creatinine and proteinuria are attributable to SLE. Daily urine protein excretion rate was estimated by measuring the Pr/Cr ratio in a 24-h urine collection (15). A nonrenal flare was declared when the patient developed one or more symptoms or signs of nonrenal SLE (Table 1) that were attributable to SLE and were of sufficient severity that the managing study physician increased therapy. The severity of nonrenal relapse was based on the British Isle Lupus Assessment Group severity categories (16). The levels of uMCP-1 and uIL-8 were measured by specific ELISA, according to manufacturer’s directions (BioSource International, Camarillo, CA; and Pierce Endogen, Rockford, IL, respectively). For uMCP-1 measurement, we determined the ELISA intra- and interassay coefficients of variation to be 8.5 and 11.2%, respectively. The recovery of MCP-1 in urine was 88%, based on adding a known amount of human recombinant MCP-1 to urine samples from different individuals. The lower range of the MCP-1 assay is 31.2 pg/ml. Urine values below this were considered undetectable and assigned a value of zero. The IL-8 ELISA was validated for urine measurement by the manufacturer and had intra- and interassay coefficients of variation of <10% and an average urine recovery of 120%. The lower range of the IL-8 ELISA is 25 pg/ml. Urine values below this were considered undetectable and assigned a value of zero. Urine chemokine levels were standardized to urine creatinine measured in the same spot urine and expressed as pg/mg Cr. Data are shown as mean ± SEM. Comparison between two groups was done with t test. Multiple groups were compared using one-way ANOVA or repeated-measures ANOVA as appropriate. Data that were nonnormal were either log-transformed before analysis or analyzed by a Kruskal-Wallis ANOVA. Specific groups then were compared with Bonferroni or Student-Newman-Keuls post hoc tests or Dunn’s multiple comparisons test for nonnormal data. Associations were tested by linear regression. P < 0.05 was considered significant. Table 2 shows the demographics and number and severity of SLE flares of the patients described in this report. In addition to healthy volunteers, control subjects for this study included 15 patients who had a history of SLE nephritis and 18 patients who had a history of nonrenal SLE and did not have an SLE flare during the observation period. These patients served as disease control subjects for renal and nonrenal SLE, respectively. The disease control subjects were taking similar maintenance immunosuppressive medications as the patients who had flares. Figure 1 shows uMCP-1 and uIL-8 values at renal and nonrenal flare. The mean uMCP-1 of patients at renal flare was significantly higher than that of healthy control subjects, renal disease control subjects, and SLE patients with nonrenal flare. Despite some overlap between control and patient levels, uMCP-1 seems to be a sensitive indicator of renal flare. Seventy-three percent of flare values were above the 95th percentile of those of disease control subjects. In contrast to renal flare, uMCP-1 did not increase during nonrenal flare. The absolute levels of uMCP-1 were much higher than uIL-8 levels, and there was no correlation between uMCP-1 and uIL-8 at renal flare. Furthermore, there was no difference between uIL-8 at renal flare and uIL-8 from renal disease control subjects and, although statistically significant, only a modest increase compared with healthy control subjects. Urine chemokines at renal and nonrenal SLE flare. Each symbol represents an individual flare. The bars indicate mean chemokine values. 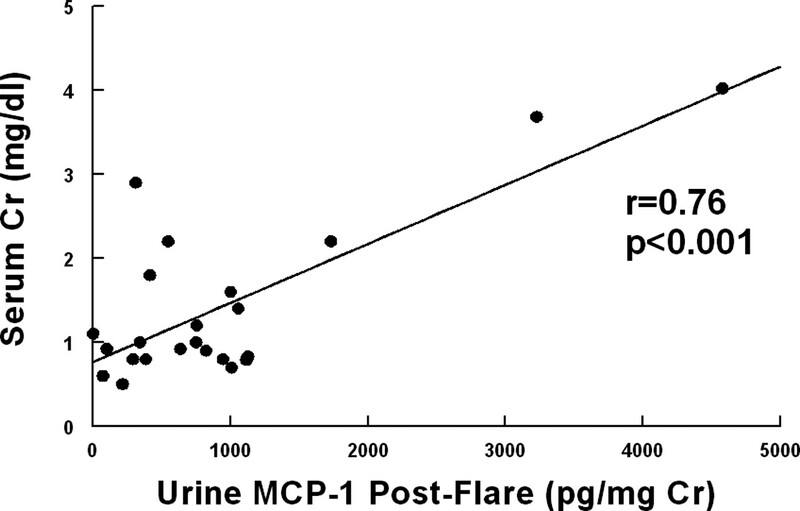 (A) The mean urine monocyte chemoattractant protein-1 (uMCP-1) level at renal flare (Flare-R) was significantly higher than the mean value at nonrenal flare (Flare-NR; *P < 0.001) and from healthy individuals (control; *P < 0.001) and SLE renal disease control subjects (SLE Cont-R; *P < 0.001). (B) IL-8 levels at flare were significantly increased only in comparison with healthy control subjects (*P < 0.01). The influence of immunosuppressive and renoprotective therapy before renal flare on uMCP-1 was examined. At the time of each flare, most patients had been receiving therapy with steroids (n = 27), immunosuppressive agents (mycophenolate mofetil, n = 20; azathioprine, n = 3; or cyclophosphamide, n = 2), or both. There was no relationship between urinary chemokine levels at flare and the cumulative amount of prednisone or immunosuppressives received during the preceding 30 d (data not shown). During 11 renal flares, patients were taking an angiotensin-converting enzyme inhibitor or angiotensin receptor blocker. This group had a similar level of uMCP-1 as that of patients who were not taking these medications (data not shown). Analysis of uMCP-1 and indices of renal injury showed a positive correlation between uMCP-1 at renal flare and the increase in proteinuria from 2 mo before flare to flare (P = 0.01; r = 0.68). There was no correlation with the absolute magnitude of proteinuria at flare. The mean level of uMCP-1 during renal flares with impaired renal function, identified by elevated serum creatinine (range, 1.2 to 5.5 mg/dl; n = 14), was significantly higher than uMCP-1 during renal flares with normal renal function (2719 ± 846 versus 805 ± 230 pg/mg Cr; P < 0.05). In addition, uMCP-1 after renal flare was positively associated with serum creatinine 2 mo after flare (Figure 2) and 4 mo after flare (P < 0.002, r = 0.62). Association between uMCP-1 and serum creatinine. Serum creatinine level 2 mo after renal flare was plotted against uMCP-1 level 2 mo after renal flare. As indicated, there was a significant correlation between creatinine and uMCP-1. The relationship between uMCP-1 and the clinical and pathologic severity of renal flare is shown in Figure 3. As expected, MCP-1 levels increased with flare severity (Figure 3A). Furthermore, patients with proliferative forms of SLE GN (World Health Organization classes III and IV) had higher uMCP-1 at renal flare than patients who had nonproliferative GN (World Health Organization class V; Figure 3B). The kidney biopsies of 14 of the 25 patients with renal flare were obtained well before OSS enrollment, so the histology may have changed over time, possibly accounting for some of the variability in uMCP-1 seen in Figure 3B. However, biopsies of 11 patients with renal flare were done around the time urine was obtained for chemokine measurement and could be used to examine patterns of kidney injury associated with high uMCP-1. Patients with class IV GN and prominent glomerular crescents and/or necrosis had the highest levels of uMCP-1 (1000 to 12,000 pg/mg Cr; n = 5). Patients with class III and IV GN and occasional glomerular crescents and/or necrosis (n = 3) had more modest uMCP-1 levels (400 to 900 pg/mg Cr). It is interesting that high uMCP-1 (1000 to 2000 pg/mg Cr) was also observed in two patients (class IV and class V) whose biopsies demonstrated glomerulosclerosis, interstitial fibrosis, and interstitial inflammation, in the absence of active necrotizing, crescentic glomerular lesions. Relationship between clinical and pathologic severity of renal SLE and uMCP-1 level. (A) The severity of renal flare was determined by the prespecified criteria outlined in Table 1. The central tendency of uMCP-1 showed an increase from mild to more severe renal flares. The level of uMCP-1 was significantly higher for patients who experienced a severe flare than for those who had mild or moderate flares (*P < 0.05). (B) Patients were divided into proliferative (World Health Organization classes III and IV) and nonproliferative (membranous; World Health Organization class V) groups on the basis of renal biopsy reports done when SLE glomerulonephritis (GN) was documented. Patients with classes III and IV nephritis had a higher uMCP-1 at renal flare than patients with class V nephritis (P < 0.04). Urine chemokine expression before, during, and after renal flare is illustrated in Figure 4A. Mean uIL-8 showed no relationship to flare status. At 4 and 2 mo preceding renal flare, the mean uMCP-1 levels were numerically higher than those of renal disease control subjects (compare with Figure 1) and renal flare patients who were sampled during stable renal disease activity (209 ± 28.6 pg/mg Cr; n = 7). There was a significant increase in uMCP-1 at flare, and uMCP-1 levels declined only gradually in the 4 mo after flare, despite increased therapy (Table 3). The postflare relationship of uMCP-1 to serum creatinine and proteinuria was examined in more detail in 12 flares, and three general patterns emerged (Figure 4B). uMCP-1 decreased, and proteinuria, creatinine, or both improved after treatment of six flares. In a second group of three flares, uMCP-1 remained high for several months in association with elevated creatinine, nephrotic-range proteinuria, or both. Finally, uMCP-1 was persistently high after three flares despite a marked improvement in proteinuria. Two of these last patients also had a persistently abnormal creatinine after flare. Time course of urine chemokine levels in relation to SLE renal flare. (A) uMCP-1 and uIL-8 were measured in samples from the same patients obtained 4 and 2 mo before renal flare, at renal flare, and 2 and 4 mo after renal flare. Mean uIL-8 did not change over the course of an SLE flare cycle. Mean uMCP-1 increased significantly at flare (*P < 0.002 versus preflare time period), and levels remained elevated for at least 4 mo after flare. (B) The pattern of recovery of uMCP-1 after treatment for renal flare was examined. Serial measurements of serum creatinine, urine Pr/Cr, and uMCP-1 were made before (-2), during (F), and after treatment of renal flare. Three patterns of uMCP-1 expression after flare emerged. In six of 12 flares, uMCP-1 levels declined and patients improved (B-1, representative time course). A second group (three patients) did not improve, and uMCP-1 levels remained high for months (B-2, representative time course). Finally, three patients showed persistently high uMCP-1 after flare despite marked improvement in proteinuria (B-3, representative time course). It has been well established that proinflammatory chemokines play a critical role in the pathogenesis of experimental SLE nephritis (1–3,5,17) and that the presence of chemokines in the urine of patients with SLE nephritis reflects intrarenal chemokine expression (6–9,18). To characterize better the relationship of chemokines to SLE flare and to investigate the possibility that urine chemokines may be useful for noninvasively monitoring disease activity and response to therapy, we obtained serial measurements of urine chemokines in a cohort of prospectively followed SLE patients. We found that uMCP-1 but not uIL-8 is a sensitive and specific biomarker of renal flare and the severity of kidney injury in SLE. The evidence for this is summarized as follows: (1) uMCP-1 increased significantly at renal flare compared with a control group matched for disease and medication use. In addition, the changes in uMCP-1 over time paralleled the onset and resolution of flare. In contrast, uIL-8 at flare did not increase compared with renal disease control subjects and showed no relationship to flare status. (2) Nonrenal SLE flares were not accompanied by increases in uMCP-1 or uIL-8, indicating that urine chemokines do not reflect generalized systemic SLE activity. (3) High levels of uMCP-1 at flare were significantly associated with manifestations of severe renal injury, including abnormal renal function, proliferative GN, and the degree of change in proteinuria. This study verifies earlier reports of increased uMCP-1 in untreated patients with active SLE nephritis (6,9) but importantly extends this observation to patients who developed active SLE while on maintenance immunosuppressive therapy. uMCP-1 increased significantly at renal flare despite moderate to intense immunosuppression (prednisone, mycophenolate mofetil, azathioprine, or cyclophosphamide) before chemokine measurement, suggesting that uMCP-1 is a robust marker of SLE activity that is valid in patients who have chronic disease and are on long-term therapy. However, this background of immunosuppression may partially account for the fact that uIL-8 did not significantly increase at flare, in contrast to other investigations that measured uIL-8 in untreated SLE patients (7,10,11). Another key feature that distinguishes this investigation from previous studies of urine chemokines and other cytokines in SLE (6,9,19,20) is the extensive serial measurements of chemokines made during the flare cycle. These measurements demonstrated that mean uMCP-1 levels were greater than healthy and renal disease control levels as early as 2 to 4 mo preceding a renal flare. This observation is consistent with a pathogenic role for MCP-1 in the initiation of SLE flare and suggests that early increases in uMCP-1 may predict flare onset. However, because baseline urine specimens from 6 mo or more before flare were not available for most of the renal patients who had a flare, we are prospectively collecting additional baseline samples to validate uMCP-1 as a flare predictor. Although unlikely, it will also be relevant to verify that uMCP-1 does not increase in patients with acute changes in creatinine not attributable to SLE nephritis (e.g., hemodynamically or medication mediated). The importance of serial versus isolated measurement of uMCP-1 is further emphasized by examining uMCP-1 levels at flare between subgroups with different levels of renal flare severity. Although a causal relationship between MCP-1 and renal injury is suggested by the significant trend of increased uMCP-1 with increased severity, the overlap between groups somewhat diminishes the utility of uMCP-1 as a clinical marker of severity. By using individuals as their own controls, the specificity of uMCP-1 for the clinical manifestations of renal flare should improve. Examination of uMCP-1 after flare demonstrated a close relationship between uMCP-1 and response to therapy. Consistent with previous investigations (6,9), we found that uMCP-1 decreased in patients who responded to treatment. However, serial measurements of uMCP-1 showed that it did not normalize rapidly after treatment but declined over 4 or more months, paralleling the improvement in proteinuria or creatinine. In contrast, uMCP-1 remained elevated in patients who did not respond to therapy. These findings support the experimental animal data showing a causal role for MCP-1 in renal injury during SLE GN and highlight the inadequacy of conventional immune therapy in suppression of renal MCP-1 expression. This suggests that specifically targeting MCP-1 could reduce time to remission and result in a more complete resolution of disease flare in patients with SLE nephritis. Postflare MCP-1 measurements also identified a subset of patients whose proteinuria significantly improved with treatment but who continued to have persistently elevated uMCP-1 levels. It is intriguing to speculate that the elevated uMCP-1 in this group reflects ongoing subacute renal injury without active glomerular inflammation. Although this study and others found the highest levels of uMCP-1 to be associated with crescentic or necrotizing class IV glomerulonephritis (6), high uMCP-1 levels have been reported in class V nephritis (18) and correlated to glomerular scarring and interstitial inflammation in SLE nephritis and IgA nephropathy (8,21). Cases of high uMCP-1 associated with glomerulosclerosis, interstitial inflammation, and interstitial fibrosis, in the absence of active glomerular lesions, were also observed in our SLE cohort. These data suggest that MCP-1 may initiate renal injury through multiple mechanisms. This is feasible because in addition to proinflammatory activity, MCP-1 is profibrotic in vitro (22) and mediates renal fibrosis in experimental kidney diseases (23–25). Therefore, persistent expression of MCP-1 could result in chronic glomerular and tubulointerstitial injury, which may explain the association of high uMCP-1 and elevated serum creatinine in the postflare period. In summary, serial measurement of uMCP-1 shows that it is a sensitive biomarker of renal but not nonrenal SLE, even in chronic patients who are on maintenance immunosuppressive therapy. Urine MCP-1 levels seem to predict impending flare, flare severity, and response to treatment but may be less useful for predicting renal histology. In addition, abnormal uMCP-1 levels may identify patients with ongoing subclinical renal injury. Unlike most conventional clinical biomarkers, MCP-1 is also a potential therapeutic target in SLE nephritis. Therefore, serial uMCP-1 measurements can be used to appropriately identify and monitor recipients of novel antichemokine therapies that become available. This work was supported in part by P01 DK 55546, M01 RR 00034, and the Lupus Clinical Trials Consortium. Portions of this work were presented in abstract form at the 2004 American Society of Nephrology Meeting in St. Louis, MO, October 31, 2004. Can We Personalize Treatment for Kidney Diseases?